All classes are mixed - No special classes for advanced students. We welcome students from other schools who wish to visit, without memberships to the “Y” to practice with us occasionally. Just let us know in advance. You can try a class before registering. Please wear track pants and let us know so we can arrange your pass to the YMCA. 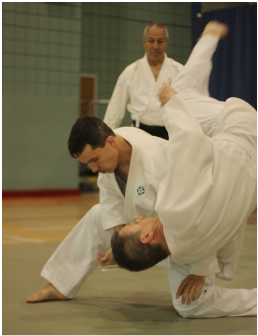 The West-Island YMCA is the only "Y" in Quebec that offers Aikido. More details about the YMCA are here. You must be a member of any YMCA in order to participate in the aikido class. Please go to the front desk to know more about the different plans they have. Some companies offer corporate discounts. Once registered, no additional fee is required. So, besides practicing aikido, you and/or your family members can also use the facilities and join other activities.